When I think about the concept of "unplugging," I think turning off my phone, leaving it at home, and going toward nature. 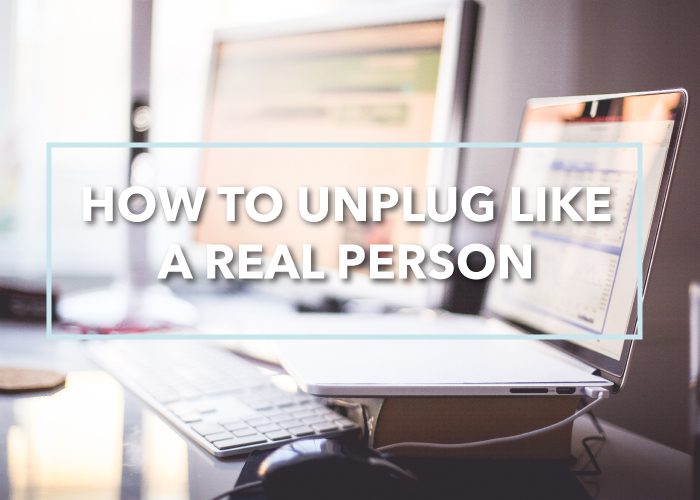 Unfortunately, being completely and totally unplugged isn't necessarily a real option we get to implement every day. Yet, I, like so many others crave to experience moments each day that are decisively lacking in technology. The question is how do we do that? How do we unplug each day? More so, how do we unplug each day without condemning our technology, but rather embracing our habits toward it in small, significant ways? We've all been that person and by that person, I mean the person glued to the screen of one device or another, just one notification away from losing our minds. Am I right? Between computers, tablets, smartphones, TVs, and even our watches we live an era where technology has truly taken over every facet of our life in some way or another. We cycle from screen to screen all day (or at least I do) trading out the screen of my laptop during the workday for the screen of my iPhone during my lunch break and then the screen of a TV when I get home. As amazing as technology is, it can feel hard to take a few steps back and just stop for a second. I found myself in the same position as so many others, truly desperate to find a way to unplug, but completely not connecting with most of the modern advice out there about going on a digital diet. Most advice or articles I stumbled upon, I found either too extreme or too impractical. The extreme side usually contained articles with the headline reading something like, "This woman ditched the internet for an entire year! Here's what she's learned and here's how you can do it too." Uhm, I'm looking to learn how to ditch the internet for an entire lunch break, not an entire year. Find me a modern woman who resisted a scroll on social media during their lunch hour because that's who I want to talk to. The too impractical side usually contained advice like, "Leave your phone in another room while you sleep at night." Though not bad advice, that concept seemed ridiculous to me. Leave my phone in entirely other room to charge? Are you insane? Since I use my phone as an alarm clock and just generally like the safety of knowing it is close by (call it phone-related millennial anxiety, whatever), I didn't think I could realistically leave my phone out of reach overnight unless I was on vacation. I wanted small, tangible ways I could reduce my daily technology intake like a real person with a real life. I wanted to discover little ways to slowly change my tech habits and to truly embrace methods of daily unplugging. Here's what I've come up with. Meal time is a sacred time. I know it’s hard to resist scrolling on social media or sending a quick text during meal time while you wait for food or during conversational down time (especially if it’s dinner and you’ve been away from your phone during most of the work day). However, meal time is when you should be connecting with whoever you’re sharing your meal with. By being distracted at the table by your phone or tablet, you send the message that the person you’re with is unimportant or at least less important than your phone. Putting human interaction at the forefront of meal time is never a bad idea whether it be with family, friends, or co-workers. Even if you aren’t with any company, try thinking about meal time as an opportunity for some valuable “me” time at the beginning of, in the middle of, or after a long day. Remember to just sit and savor your food and enjoy the quiet you don’t often get to indulge in. My boyfriend and I try to keep our phones out of the equation during meal time. Some days it works better than others. If we decide to allow the phones, we both make the choice to get on simultaneously so one of us doesn’t feel ignored or unimportant. It usually leads off with him saying, “I have to make this business deal happen. I’m going to send some money via Paypal and be right off.” I understand this and take the time he needs to do a quick task as a chance to check notifications, send a text, or give social media a quick scroll. Once he’s done, we’re both done, the phones get put away again, and life goes on. Also, if you’re out with a group of friends try making a pile of everyone’s phones in the middle of the table where you’re eating. Everyone’s phone is in view (eliminating that anxiety of not having your phone) and everyone feels like they’re making a collective choice to forgo phones in order to spend quality time conversing with the group. Put the phones face down so no one is tempted to grab their phone at the first sign of a notification. First things first, I’m not telling you to quit using your apps. We’re modern people who curate the apps on our phones like we do art on our walls - with considerable and selective efforts. We search for those valuable apps that offer us both form and functionality. Few apps make the cut and those that do get used with high frequency. However, apps tend to be the most distracting thing on our phones; more than email and more so than texts even. I constantly am mind-numbingly checking my apps and social media feeds throughout the day, often time without intention, in the gaps of time where something better isn’t directly calling for my attention. Apps can be huge time wasters and productivity suckers, but on the flip side they can be happiness-bringers, business boosters, and social connectors. So, how do we "unplug" from our apps without going entire cold turkey? Try logging out. Sure, it’s a pain to log in and out every time you use an app, but I think this extra step can create the intentional time and use behind the apps we love so desperately on our phones. Think about it, would you check Instagram nearly as often if you had to log in each time you wanted to take a quick skim through your feed or to check every little notification that popped up? No, certainly not! By logging out, I believe you will check your feed less. When you do check your feed, you will do so with more intention. You will seek out the content you truly want to imbibe instead of letting yourself be inundated by masses of visual data and information repeatedly during your day. Also, you will post more meaningful, intentional content because you’ve most likely had longer to sit on an idea instead of easily opening your app of choice and writing or posting whatever thought or photo comes to you in the moment. We've all been there, no worries. I’ll tell the truth – I’m an avid TV before bed kinda gal. Who doesn’t love crawling into bed and putting on their favorite mindless white noise sort of show (for me, it’s How I Met Your Mother)? I know there have been studies on studies that support the fact that sleeping with the TV on is all sorts of bad for our sleep cycle due to all the light and noise. Since our sleeping effects our day to day quality of life and our health longterm that’s kind of a big deal, right? Those studies extoll the virtues of unplugging at least an hour before bed for the most restful, unplugged sleep of your life. I’ve gone through phases where I’ve unplugged myself from the TV with great success at night. My sleep is deeper and my dreams are richer, and yes, I daresay, I do feel slightly more rested in the morning.There’s no question that this is probably the best advice out there. However, as nice as unplugging an hour before bed would be, it’s just not a reality for me on most nights. So, if you’re like me and can’t seem to find the TV’s off-switch right before you tackle sleep, here are a few things you can do to unplug without sacrificing your TV time. Turn down the brightness on your TV. Though it doesn’t totally alleviate the problem of light interfering with our quality of sleep, it does help to an extent. Turning down the brightness to the lowest setting on your TV can help you get into a sleepy mindset. Set your sleep timer nightly and for the same amount of time. As soon as you get in bed, set the sleep timer. I set mine for 30-60 mins depending on how tired I am. This means the TV won’t be disruptive to your sleep all night long. In fact the majority of your night will be spent in the dark, quiet, totally TV-free. You’ll wake up feeling more rested than if you were to have let it stay on the entirety of the night. If you like the TV for the extra light it provides at night, consider a small night light. If you like the TV for the white noise it provides consider light music, a sound machine, or guided meditation instead of the TV before bed (also set to a timer, so it isn’t running all night long). So, there you go! 3 quick tips on how you can subtly unplug each day. I really enjoyed writing this post and am planning a follow-up post next week that targets the multifaceted topic of unplugging from email! It's going to be good! Have you heard of or do you practice any great tips on how to unplug from technology? I'd love to know! I value each and every comment. Thank you for taking some time out of your day to leave one! Hey there! I'm Ashlee. I'm a twenty-something designer by day & a blogger by night. You'll find a little bit of everything in this space - but especially topics like beauty, design, blogging, millennial culture, productivity & more! For more visit my About section. Everything (content and copy) is the property of Ashlee and/or DearieLovie unless otherwise linked or noted. If you see something belonging to you without proper documentation, email me and I will be happy to resolve the issue. I encourage you to actively share any part of Dearie Lovie, just remember to provide proper links and credit when and where appropriate. Copyright 2011-2016.